Cheeky comment from Cher's publicist: "Many cute firemen and paramedics"
LOS ANGELES, California (CNN) -- When emergency crews scramble to a celebrity's home and it turns out to be a false alarm, journalists don't usually write about it. 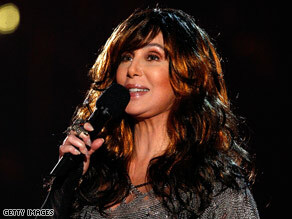 Cher made the most of a false alarm, offering admiration for emergency personnel who came to her house. When the celebrity is Cher and her publicist issues an entertaining response to a reporter's call, some entertainment writers can't resist. The electronic call for help sounded at Cher's Malibu, California, home at 11:16 a.m. Thursday, spurring a flurry of activity. Ambulances and fire trucks rushed to the singer's residence, sending journalists to their address books for Cher's contact information. "Just spoke to Cher who confirmed it was a false alarm but said she never saw so many cute firemen and paramedics in her life," said Rosenberg's response. "She added there was an especially gorgeous black-haired ambulance driver that she is really sorry she didn't get to meet. Maybe there'll be another false alarm ..."